The three variations of this dog, the Brussels Griffon (Griffon bruxellois), the Belgian Griffon (Griffon belge), and the Petit Brabancon, all descend from an old type of dog called a Smousje, a rough coated, small terrier-like dog kept in stables to eliminate rodents, similar to the Dutch Smoushond. The little wire-haired dog in the foreground of the Jan van Eyck painting The Arnolfini Marriage is thought to be an early form of this breed. In Belgium coachmen were fond of their alert little Griffons d'Ecurie (wiry coated stable dogs) and in the 19th century, they bred their Griffons with imported toy dogs. Breeding with the Pug and King Charles Spaniel brought about the current breed type, but also brought the short black coat that led to the Petits Brabancon, which was originally a fault in the breed. The spaniels also brought the rich red and black and tan colour of the modern Griffon Bruxellois and Griffon Belge. 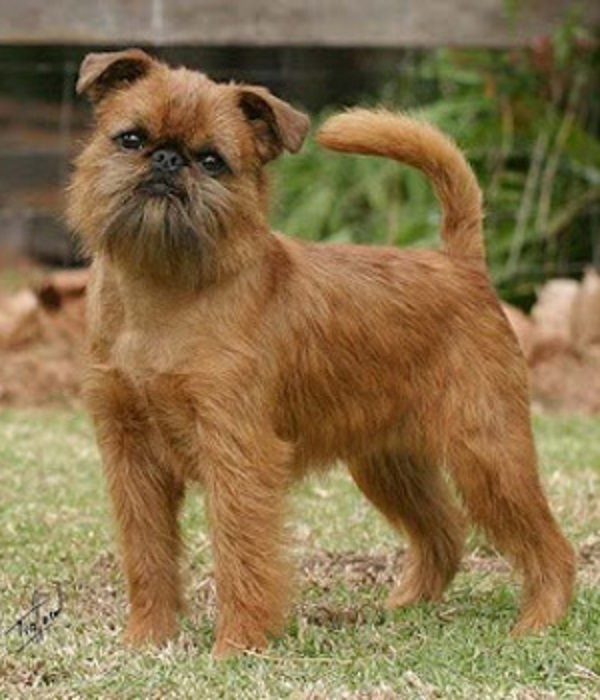 The Griffon Bruxellois grew in popularity in the late 19th century with both workers and noblemen in Belgium. The first Griffon Bruxellois was registered in 1883 in the first volume Belgium's kennel club studbook, the Livre des Origines Saint-Hubert (LOSH). The popularity of the breed was increased by the interest of Queen Marie Henriette, a dog enthusiast who visited the annual dog shows in Belgium religiously, often with her daughter, and became a breeder and booster of Griffon Bruxellois, giving them international fame and popularity.